I still haven't even started my Explorator Magos character yet! Shame on me. But Kill Team distracted me as I might have use for most of these models now! As the Rogue Trader boxed game is still a while away there's little of the actual crew other than menials, but they will be added! 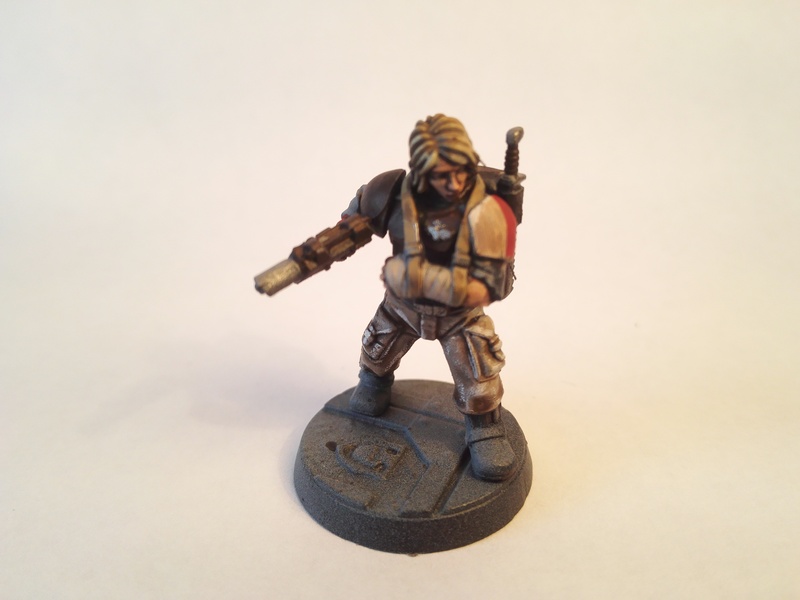 Dietrich von Mackensen - Leader of a mercenary force employed to the Magos & Agora-U-38 the Skitarii detachment leader. 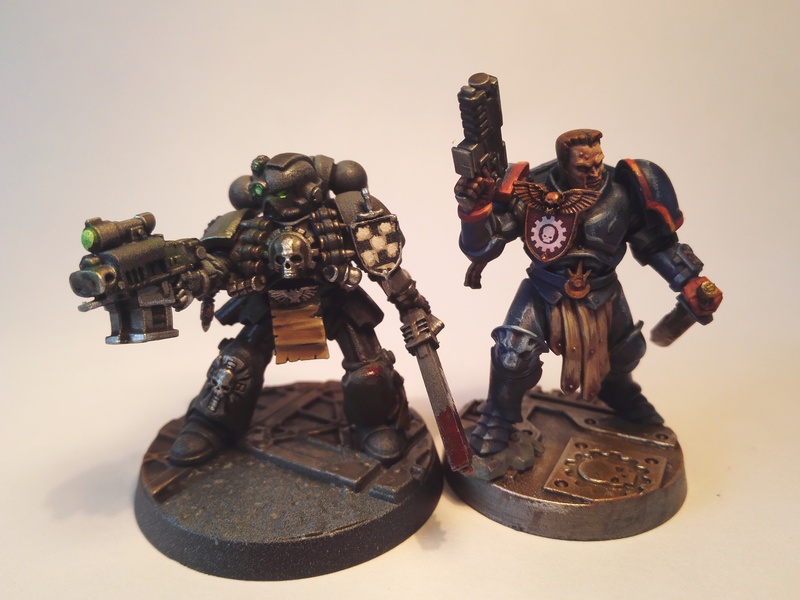 Token Astartes - Petrus Kerulios, Iron Hands Marine & Hadriel Trikis, Crimson Fists Primaris Marine and Tech Marine aspirant. 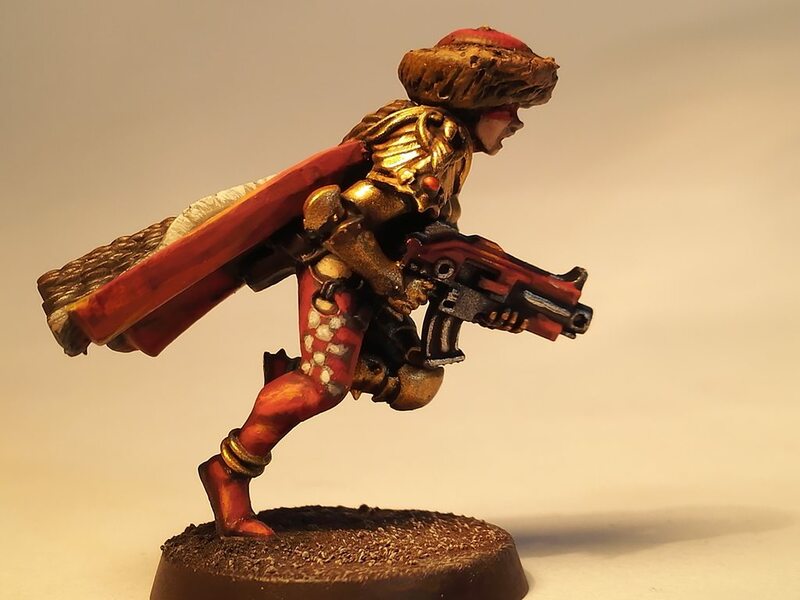 The pure Skitarii detachment - A long way from home and starting to dwindle. The current Auxiliaries, Armorium Cherub and Squire to Agora Romanus Helix, along with Irina Schoenauer (sniper), Caitlin Geadais (Tech Auxiliary - More to come) and Sneaks the Bone'ead. Awesome conversions and paint jobs! They simply ooze character! I'm honestly tempted to borrow your conversion idea of using those masked AM heads like on Caitlin and some of your serfs. I'm getting some GSC guys with that new Kill Team box and I have no real desire to use them. If I can get some of those heads via ebay or something I could put those bodies to work. Make them into inexperienced stormtroopers (guardsmen) to go along with my sisters of battle(scions). So thank you big time! For some reason I already had GSC units, wanted to add some lower-tech troopers in to make the force look more rag-tag. Feel free ahahaha. Just don't forget to share the progress! Still very early WIP but bashed some kits together - Here's the results so far. Upon the endless expedition for knowledge a sudden rift in reality really does put a spanner in the works, especially when Daemonkin are spilling through devouring worlds - Cadia has fallen, and the youth of Cadia now grown and died, a new generation of soldiers must keep the Cadian ideals alive - Which is hard while drifting through space on a damaged Firestorm-Class Frigate for 200+ years! If only a group with technical experience could assist them to repair their ship and take the fight back to Chaos in the future. Still a while away from completion, but with the Kill Team box and some other kits arriving soon I thought I'd keep myself busy with what bits I had left. When I get it sorted out I'll definitely give you a holler. Always have to give credit where it was stolen from is due. Cadians are also looking great! 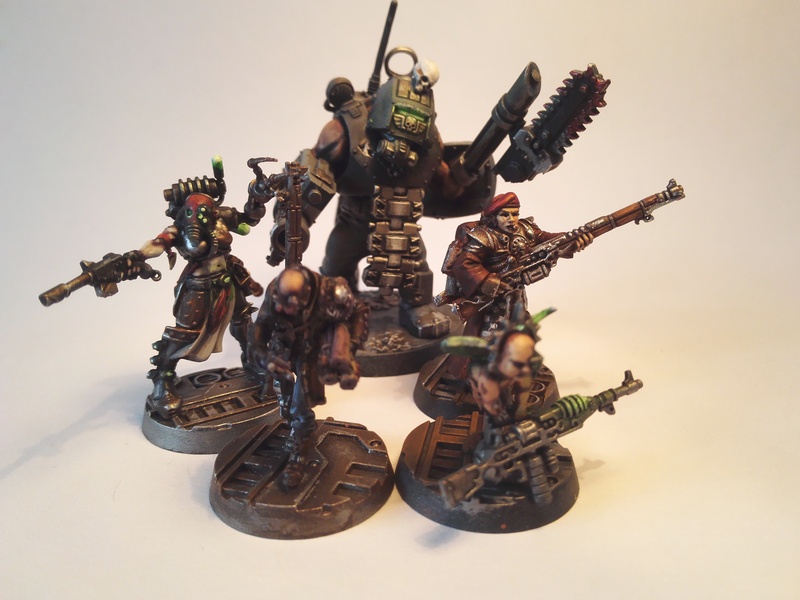 The look and color of them have some great depths and it's nice to see something post-Cadia for them as well! Eyy Cheers! Started work on them again now! Will post again when they're ready. Thanks dude! Yeah, felt like there wasn't enough post-Cadia models for them, can't imagine them being so pristine now that Cadia is gone and they're sort of a dying breed. Yeah, they are and endangered culture/regiment nearing extinction and it probably doesn't help that the rift has kept the fighting going strong. Yet that's not going to stop them from fighting...especially when they probably want revenge. That cannot help your population numbers though. I want to look into this now. I didn't read all the fluff that led up to the rift being open and cadia falling. It would be interesting to see how Cadians have carried on. Fleet based regiment? Still well armed and supplied? And what about offworld elements of their forces coming back to what's left. Yeah it seems like an unexplored angle, the idea for these guys was that their great, great grandparents (Maybe a few more greats) were there at the fall seeing as it's been 200 odd years or something and they're using hand-me-downs and have grown up onboard a battered ship which barely escaped and couldn't use warp travel due to the storms and the Gellar field generator being damaged, so they drifted, trained and occasionally fought off looting Orcs until they were found. Oh wow! 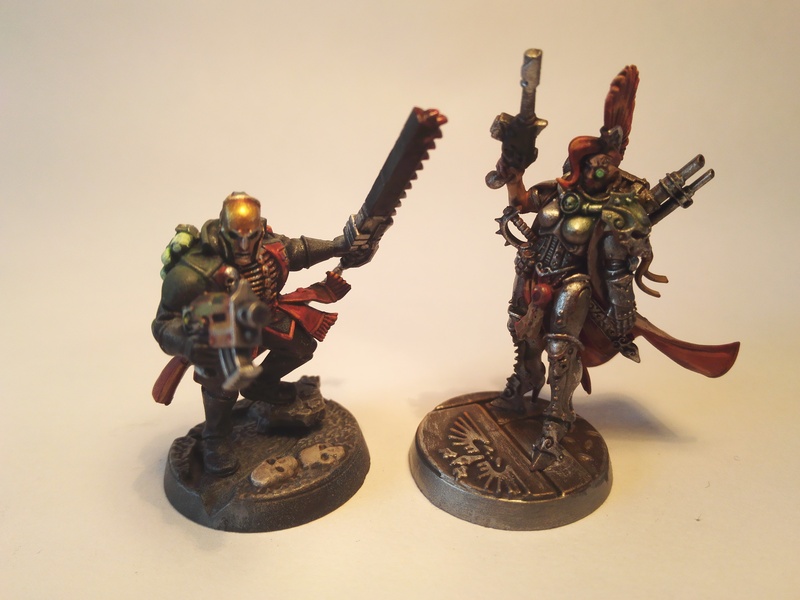 Some very cool work here - both in terms of conversions, and also paint. 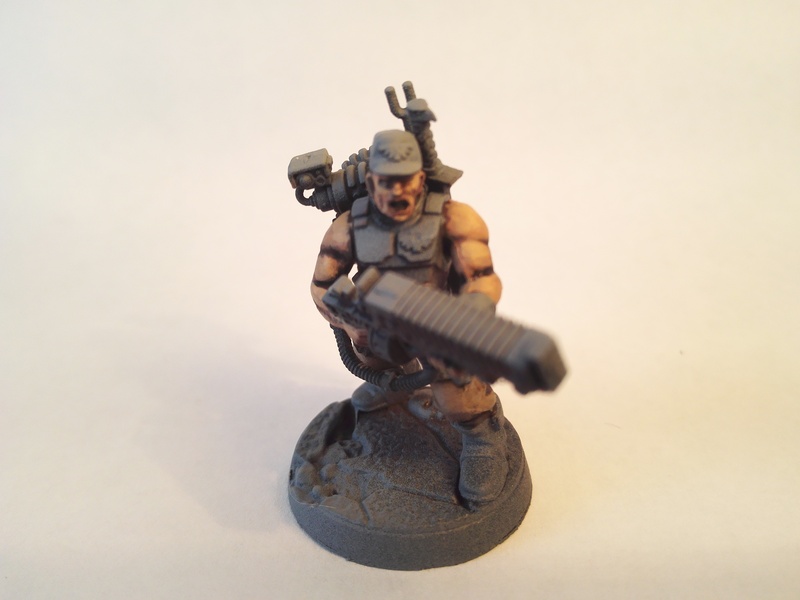 I'm surprised how well the neophyte hybrid arms go on the commissar; and amused that you're also putting a de-halo'd sigmarine haed on an imperial guard officer's body [it's something i've just done myself, and the timing is pleasantly coincidental] - GW really needs to make more masked regular human heads! 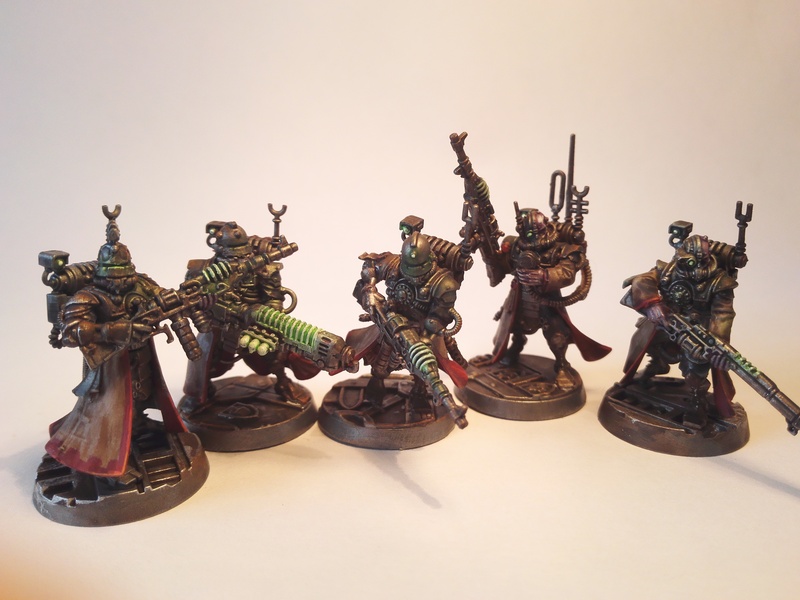 Also, very nice work using those AdMech heads to turn the neophyte hybrids into more of a 'spec ops' style vibe. And nice to see a few female heads in there for variety. Your Cadians additionally manage to look like real soldiers in positive ways - something we don't see enough of with Guard of late i feel. As applies your Astartes; the reiver-ish one using Sigmarine legs is a nifty concept - it's one of the first truescales using sigmarine basis that i've actually *liked*, as it *works* iwth the more 'anthropomorphic' armour of the regular reivers; although standing next to him, your more 'conventional' Marine looks a bit short - probably partially as a result of the wide angled leg stance from the indomitus pattern legs, or perhaps a slight 'truncation' of the torso. In any csae ... keep it up! I look forward to seeing how these continue to develop! Thanks man! Yeah it took me a bit by surprise how it fit together, I am waiting on some Scions to add to his little group. Guard just need updated kits where they aren't so chubby. Ye, ran outta normal human looking Cult heads so had to find something that worked. 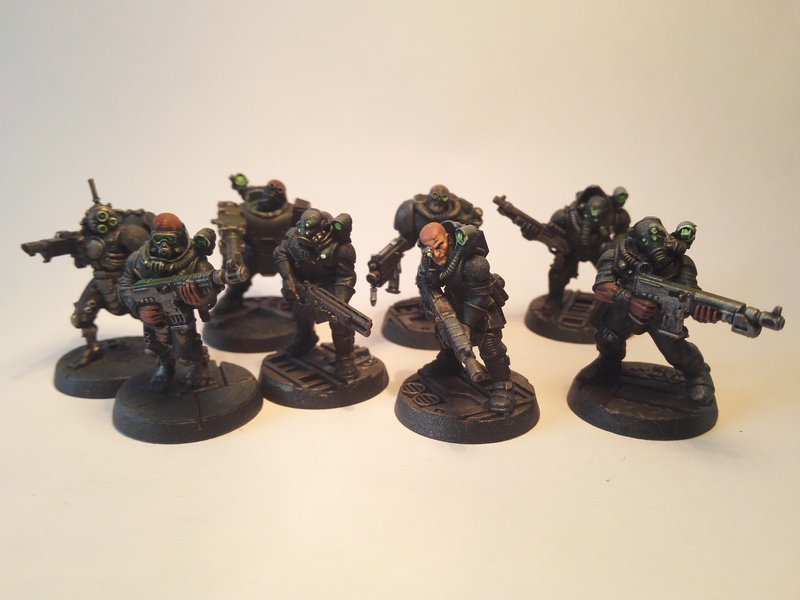 Cadians always lacked the personality of the other kits, wanna pick up a Vostroyan squad unpainted on Ebay to make a kill team from them at some point, although I really wish they got plastic kits as they're my favourites. Thanks man! Yeah the Primaris guy likes his artificer gear. The other marine isn't a Primaris so I had to keep him slightly shorter but wasn't comfortable reposing and making his torso from greenstuff as it was a one day build sorta deal so I had a model to represent a Sicarian infiltrator for Killteam. 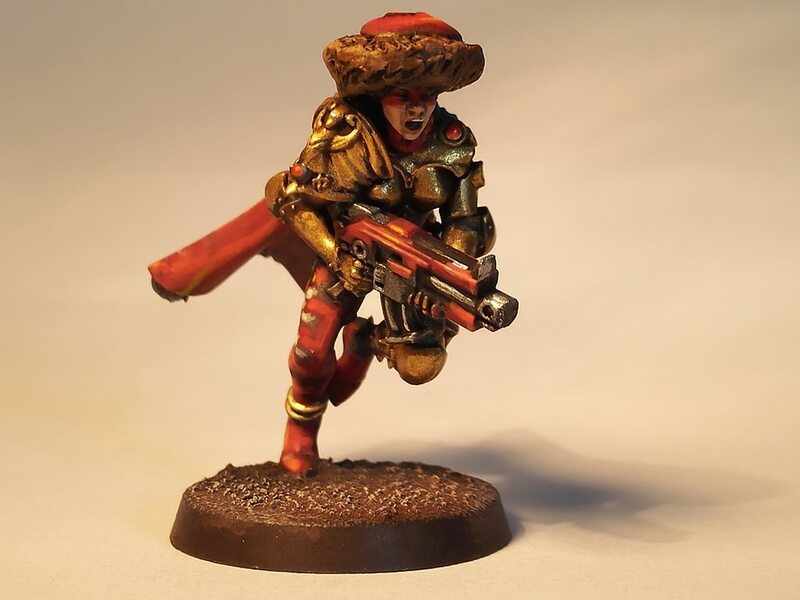 After the Cadians the next step is sorting out some more Tech Guard ala the one lady with a beret using the Skitarii included in the box set. Some absolutely lovely work in this thread! It's actually hard to decide what I like best: The commissar with the Stormcast head just works so well! The use of a shoulder pad as a welding mask/facemask on the Ogryn is pure genius! And the Cadian survivor with the bandaged arm may just be my favourite -- is that a female head from Statuesque? 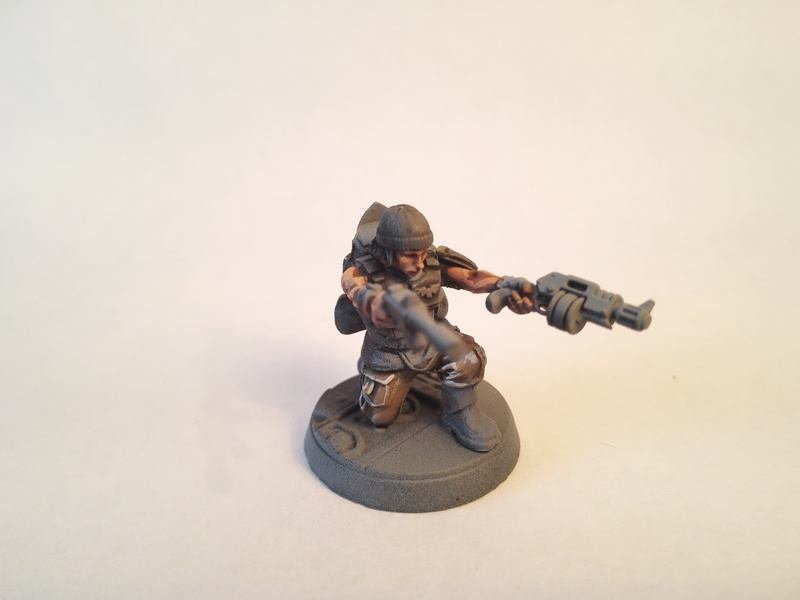 Just a small tip, in addition to frequenting this fine and vibrant forum here, I think the INQ28 section over at the Ammobunker might also be a good home for these models! Anyway, fantastic work all around! Looking forward to seeing more from you! Lovely work, really inspiring stuff. And it's really nice to see a focus on a diverse Explorator group like this. I'm very much looking forward to seeing your Magos. Thanks dude! Yeah it's statuesque - Really like their stuff. I'll give them a look! 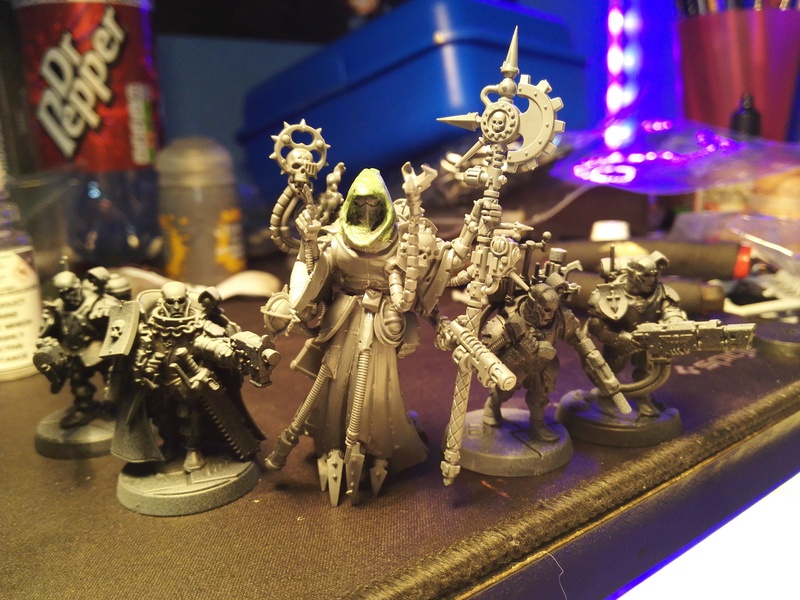 Finally got the bits I need for my magos so he should be coming soon! I'll keep it up! Been working on some other stuff recently, some is on here but a lot of it is to sell so I wanted that done first. Yeah, I felt like explorators was a cool concept for a project, might replace the serfs with the house Cawdor models with some adaptations. Here she is! Magos Explorator Ramonita Knake with the redux of Dietrich von Mackensen & His retinue. Alongside the Magos are these other newcomers: Transmechanic Coretta Fernandz alongside Rogue Trader Caprice Feindt. More to come, waiting for greenstuff to set as it stands. planning to keep expanding this project still waiting on the Rogue Trader box to drop however for a big amount of new additions. Very cool, my friend! 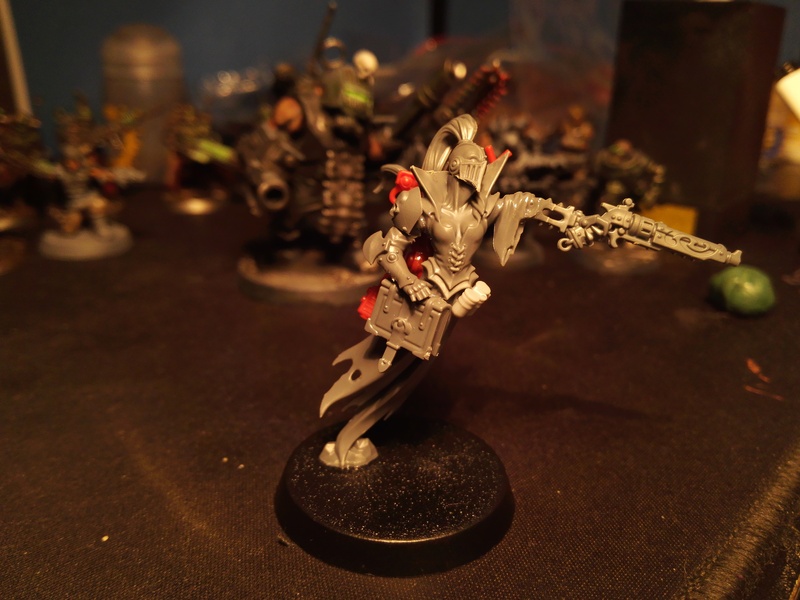 The Sister of Silence head with a hood looks gravy! Where are those two female minis from? Very Cool. I like everything here. Thanks man! Helped with the hood too, trimmed the top-knot down to add some internal structure to the cowl. 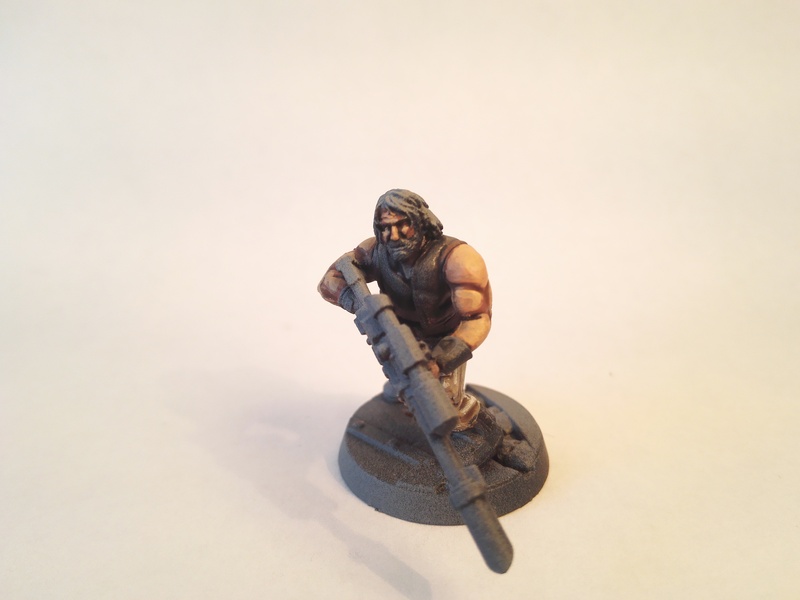 They and the little scribe are from Artel W on Etsy/Their own website, great little model studio from Russia. Just had a gander at their page now - They have a new line of Arbites that looks amazing. Thanks dude! This project has been a lot of fun! Edited by Oldest, 02 August 2018 - 12:49 PM. ARBITES!? Oh man...I actually want some for KT! Your Magos is looking great! She should look really impressive once painted. Finally, The Magos herself! - Ramonita Knake - Who holds the title of 'Mistress of the Mikula Forges' despite her standing as a renown explorator. Ironically fascinated by Xenobiology despite originating from a lifeless world. Her study was hampered by Magos Ozmerhadus Phal during his extermination campaign, and so her and the other high-ranking priesthood of Metalica drove Phal towards his inconsequential crusade against the Orks of Charadon, shortly before leaving Metalica on her 'Long expedition'. 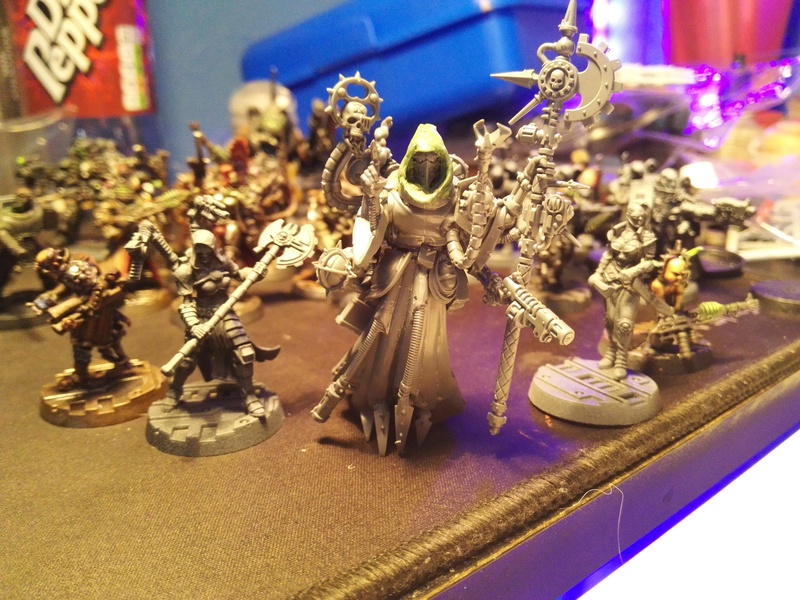 Part of the small secular conclave of Magi who disregard the dogmatic commandments of the Cult Mechanicus to pursue a course of science and reason (Yet still pertaining to believe faithfully in the 'Emperor as Machine God' openly). 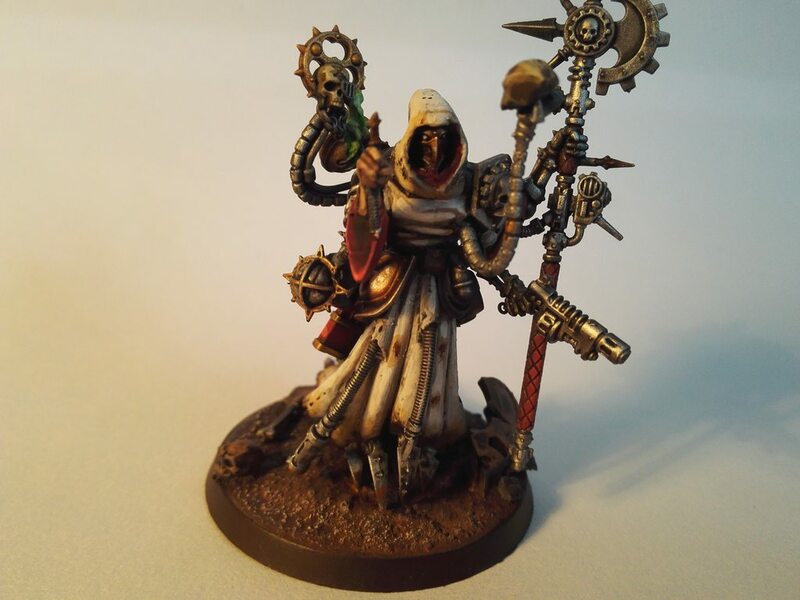 This Belief lead her to become an avid follower and acquaintance of Belusarius Cawl after the appearance of the Primaris Marines (One of which now resides within her retinue) she developed a keen interest in Astartes physiology, much to the annoyance of the Space Marines within her haphazard fleet as it zig-zags throughout the Galaxy. (Haven't done the cog teeth design on the hood yet and there is much to touch up on the model in general). Said to be a descendant of Omnissiah's earliest allies during his rise to the forefront of humanity (Or so she claims) Anya Samusenko is a Terran-born warrior from the Urals. Ferocious in combat and wholly devoted to the Machine God - yet far more reluctant than those of the Mechanicus to use extensive augmentation - Her engineering expertise is extremely useful on the quest for knowledge and Knake trusts her instincts when it comes to machinery, however this often displeases the other Priesthood members upon the Harmonides. Not made the cables yet, trying to find a comb! Edited by Oldest, 07 August 2018 - 06:37 PM.